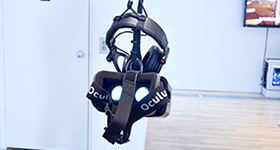 This hands-on workshop guides participants in the technical aspects of designing 3D virtual environments, including hardware setup with Oculus Rift and Unity Game Engine. This panel will address the history and future of virtual reality applications within arts, culture, and industry. Panelists will discuss how virtual reality has changed since it first gained public attention and ways it might be incorporated into society. In some ways, Virilio’s cautionary treatise has sparked a generation of artists critically engaging with new technologies while simultaneously avoiding the pitfalls of the transparent horizon. The artists in Space Between the Skies employ the power of new simulation-based technologies to remember rather than forget. Each piece in the exhibition interprets, in its own unique way, the functionality of a technological device as a means of commemoration or archiving, as opposed to creating a lapse of memory or documentation. John Craig Freeman is perhaps the most direct example of an artist using newer technologies as a means of documenting – and even recovering – cultural knowledge from the oblivion threatened by swift change. For his work Portal to an Alternative Reality VR: Minsheng Courtyard, Freeman has rendered a courtyard within the Minsheng district in the Chinese city of Wuhan. 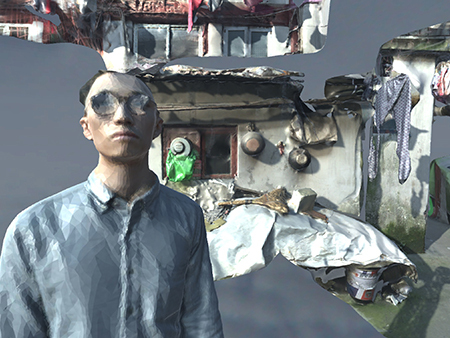 Through virtual reality technology, Freeman not only captures current topologies that will soon be lost to rapid over-development, but also reflects on the 17th century Taoist Temple that once stood at this site. Suggesting that the current state of radical change is not a new phenomenon for the multi-valenced history of China, Freeman offers a chance to look through the present into the past and back again – an ideal mode of remembrance and commemoration. Similarly Nicholas O’Brien also grapples with the past through the use of contemporary technologies in his new work Cross Timbers. By using generative and procedural systems for creating an endless simulated forest, O’Brien rediscovers lost stories of travelers and exiles who populated the Cross Timbers Forest that stretches from central Texas into southern Kansas. For nearly all of documented American history, this wooded area has served as a refuge for individuals who have run away or been cast out from various Great Plains communities. As a playable video game, Cross Timbers guides audiences to randomly encounter narratives that O’Brien has woven together through research he conducted over the past year. Situating the player as a vessel for these untold and ill-documented narratives, O’Brien invites audiences to embody the memories of a landscape. Continuing to explore the metaphorical and psychological space of the woods, the collaborative project by Seth Cluett, Ricky Graham, and Christopher Manzione uses contemporary virtual reality technology to immerse viewers in an uncanny 3D environment. By using sophisticated LIDAR technology and 360° audio recording equipment, this group captured a site in New Jersey to create a virtual reality experience that sonically guides the viewer into a serene, enveloping space. However, the recording from the scanner by Manzione is purposefully incomplete and fractured. Cluett and Graham then re-fill the space left over from the imprecision of the scan with ambient swells and flourishes. Recombined in virtual reality, the original recorded visual data represents a fleeting memory, while the aural interpretations act as an attempt to regain what was lost. Where Virilio would suggest that the virtual “window” or “teleport” would create a sensation of “no more delay” or “no more relief,” this piece instead offers a contemplative manifestation of how we try to hold on to lingering impressions. Departing from more straightforward efforts to preserve the memory of a historical place or time, Rachel Rossin’s work takes a more metaphorical and poetic turn. By switching between a combination of photogrammetry processes, video game engines, VR headset out, and traditional oil painting, Rossin uses newer technologies to approach familiar, quotidian scenes. Using the familiarity of objects in her home, Rossin’s Lossy series explores the blended realities of the canvas and the computer screen. Rossin’s work stands as an argument for the ways in which both mediums attempt to address the virtual properties of things: their air, their meaning, their aura. Rossin’s work shows viewers how a combination of both techniques is a requirement to create a more full representation of an object’s significance. In doing so, Lossy is a kind of diary – a series of combinatory and technologically mediated anecdotes that give us a glimpse into the subtle memories of a quiet moment at home. Veering even further from the literal interpretations of remembering places of a specific origin, Seth Cluett’s individual contribution to the exhibition, Breaking Ecomimesis, replaces the romantic notion of “individual in the landscape” with an artificial and – as Cluett put it – highly resolved sonic simulation of a rural landscape. Cluett argues that the traditional sublime landscape is achieved not merely by the view of an endless vista but also with spatial auditory cues of sights unseen. When we look out towards the prairie, we expect to hear the wind howl over the rolling, faraway hills. Cluett punctures our presumptions with aural disturbances that interrupt the audience’s expectations of a typical field recording. As a result, Breaking Ecomimesis highlights the ways in which sound, alone and divorced from image, can destabilize immersive vision. Cluett’s work introduces the notion that the predictability of remembering must be challenged or interrupted. The immersive quality of all the pieces in this exhibition works against the consequences of the constant telepresence that Virilio critiques. The telecommunication technologies that fall under Virilio’s analysis are thought to leave little room for reflection and introspection. 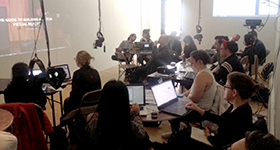 In some way, Virilio’s critique of technology is a product of its time – delivered at the dawn of 24-hour news networks and cable television, as well as emerging techniques for delivering real-time social, political, and environmental data that are “teleported” and transmitted across the globe. In truth, Virilio’s critique is apt for reflecting on the ways in which those technologies, on full blast and always live, channel a forgetfulness via so-called transparency. However, the transparent horizon has given rise to other forms of media exchange, namely to the emergence of interactive experiences. In other words, where CNN has to fill time, the technologies in this show open up time. The transparent horizon of constant information overload funneled by live-media and real-time data is mitigated by the voluntary experience of exploring a simulated world. An important element of Virilio’s transparent horizon is that information, media, images, and data are all being transmitted to you in such a way as to render your body as well as your senses into passive receptors. With (re)emerging technologies that allow for interactive storytelling and simulated spatial navigation, one’s senses are invited to come to the forefront. This leveraging of our sensory capabilities found in the works on view within Space Between the Skies acts against Virilio’s critique of contemporary technology by transforming our media experiencing into an interactive exchange. Perhaps the play that occurs between our senses and our (new) media could reformulate the auspicious warning of Virilio’s transparent horizon. The transparent horizon, instead of being a space of erasure and noise, could be a place where media can enhance and augment our senses in order to stimulate new possibilities. Being active participants in the technologies that we consume, or else having agency in the sensory reception of media, could side-step – or potentially reverse – Virilio’s civilization of forgetting. It is important, however, to pepper the excitement that surrounds this technology with some cautionary awareness that we are not merely replacing one transparent horizon with another. In thinking about the critical application of the technologies employed within Space Between the Skies, we must remember to create immersive spaces that engage our senses and our bodies. * Paul Virilio, Open Sky, 1997. "The spiritual world is not a world of unrealised ideals, over against a real world of unspiritual fact. It is, on the contrary, the real world, of which we have a true though very incomplete knowledge, over against a world of common experience which, as a complete whole, is not real, since it is compacted out of miscellaneous data, not all on the same level, by the help of the imagination. There is no world corresponding to the world of our common experience. Nature makes abstractions for us, deciding what range of vibrations we are to see and hear what things we are to notice and remember." 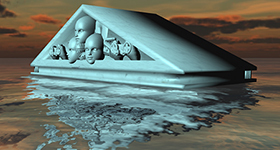 Christopher Manzione is currently Assistant Professor in Visual Arts and Technology at Stevens Institute of Technology. He earned his M.F.A. from Rutgers University in 2009. He is founder and director of the Virtual Public Art Project, an organization that uses Augmented Reality to produce original artist works in public space. Manzione most recently received a 2014 Fellowship through Franconia Sculpture. In addition he was a 2013 Fellow for New Jersey State Council on the Arts, artist-in-residence at William Paterson University’s Center for Computer Art and Animation (2011), Socrates Sculpture Park (Emerging Artist Fellowship, 2010), Vermont Studio Center (Full Fellowship, 2009), and Anderson Ranch Arts Center (2009). He has shown nationally and internationally at venues such as the Boston ICA, Abington Arts Center, Philadelphia International Festival of the Arts, the Surry Hills Festival in Melbourne, and Gurzenich Koln Museum in Cologne.